When fishing for salmon at Alaska Premier Charters, Inc., you will use a fishing style called “mooching.” You will be set up with a nine foot long salmon rod geared with a Shimano Tekota 600LC level wind reel with a Line Counter. At the end of your line will be a free-sliding lead that will be from two to eight ounces (depending on depth and current), a bead chain swivel and a six to eight foot leader with double hooks, baited with a cut-plug herring (herring with the head cut off at an angle.) 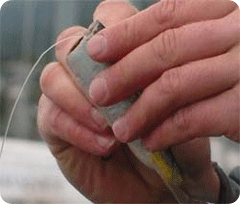 When you gently cast your line out, the bait should spin and the lead should slide to the lowest point in the line. 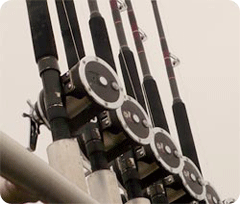 Once the line is tight and the rod feels heavy, set the hook in the fish’s mouth by jerking your rod upward. 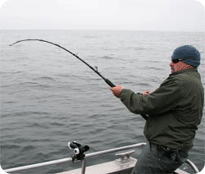 Then continue reeling, keeping your line tight, and set the hook again. It may be necessary to follow your fish by walking around the boat. With our full walk-around decks, this is easy and safe. You may have to go under, over, and around the other people fishing with you, which is perfectly okay. Once your salmon is near the surface, your captain and deckhand will be there to assist you in landing or releasing your fish as needed. Should you require help with any aspect of mooching for salmon, just ask, and we will do everything we can to make this an enjoyable and successful fishing experience each day! 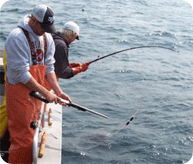 For halibut fishing, you will use shorter, stouter rods with heavier line and circle hooks. The hooks will be baited with guts, gills, herring, and/or other chunks of bait fish, which sends out a scent trail to the halibut. Each line has a one to two pound lead. Since halibut are bottom feeders, you need to let the line out until the lead hits the bottom, and then reel up four to six turns. (If you leave the bait laying on the ocean floor, you may accidentally catch a starfish, which is something you don’t want to do. There is also a possibility that a non-hungry halibut will come and lay on the bait, saving it for later, similar to a dog covering up a bone. 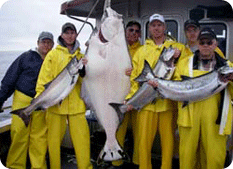 Reeling up off the bottom a few turns increases your chances of hooking a halibut sooner.) Then you wait. Halibut have a very strong sense of smell, so will come from a long way away, once the smell reaches them. 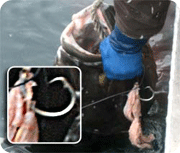 With a circle hook, halibut won’t get hooked immediately. They like to nibble the bait first, then take it back to the bottom to eat. That is when the circle hook will catch in the corner of the mouth and gradually work its way into their jaw. So when you first notice you’re getting a bite, you don’t want to reel up right away. If you reel up too soon, the halibut may follow and hold onto the bait for a little while, but soon will be out of its comfort zone. And since it is not hooked yet, it will let go and swim back down to the bottom and you will reel up an empty line. When the bait has been nibbled on awhile, and the rod is heavily jerking, that is usually a clear sign that the halibut is hooked. At that point, it is safe to start reeling the halibut up. 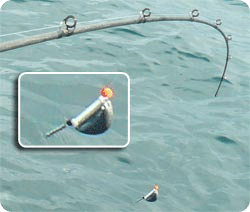 In this case, you may want to leave the rod in the rod holder, reeling in motion with the ocean swell. When the boat goes down in the swell, reel the line in. When the boat comes up in the swell, just hold the tension on the line, and reel again once the boat goes back down in the swell. This will help prevent your muscles from becoming overly fatigued. Only when the halibut is visible below the surface do you need to take the rod out of the rod holder. Do not reel so much that the halibut’s nose breaks the water. That will cause it to go crazy and power back to the bottom, possibly 400 feet down, and you will have to spend extra time and energy bringing it back to the surface. Your captain and deckhand will be there to assist in either gaffing or shooting the halibut (depending on its size) and bringing it on board.